Stick is a handy application that allows you to create these tabs that stick on the sides of applications, windows, and pretty much whatever else you wish. 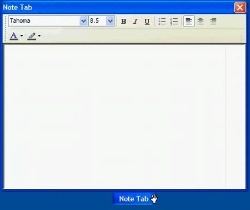 You can customize these tabs to open up the internet, calendar, or anything else or just hide-away until you need it. It provides a single-click solution to accessibility which makes it extremely handy when you’re looking to do work efficiently. The memory footprint is extremely small, so this is an incredibly fast tool that doesn’t take up your precious memory with bloat. Yet, it also implements hot keys, and drag-and-drop functionality so that you can gain access to things in a jiffy. Totally great, and on top of that, free. Windows only. It also allows you to create your own plugins if you know C++ and MFC and has its own framework for the plugins. Three of them are already created: one for RSS feeds, one for a calendar, and one for a calculator.